Customer satisfaction is important for companies to drive sales, and that is why Argus has developed a slew of tools to track just that. According to the J.D. Power 2014 Appliance Retailer Satisfaction Study, HHGregg beat out Lowe’s, Best Buy, and other revered competitors to rank highest in appliance retail customer satisfaction. HHGregg amassed a score of 819/1,000, performing especially well in sales, delivery, and installation. Here at Argus we were struck by this assessment, so we did some investigating to find that our data lead to a similar conclusion. We created the chart below using consumer reviews to graph major retailers success according to perceived customer satisfaction and brand popularity. By constantly tracking the content and volume of consumer reviews, Argus can monitor satisfaction year round. (We don’t have to wait for an annual survey!) As you can see, HHGregg has the highest NPS (Net Promoter Score), meaning that their customers give the best reviews. However, they have a low buzz volume because less people are reviewing their products, which translates to less brand popularity. This combination of a small amount of great reviews reveals massive potential of growth for HHGregg-if only they can get more people to talk about them. Best Buy is close behind HHGregg in terms of NPS, which put them second on our list for customer satisfaction. 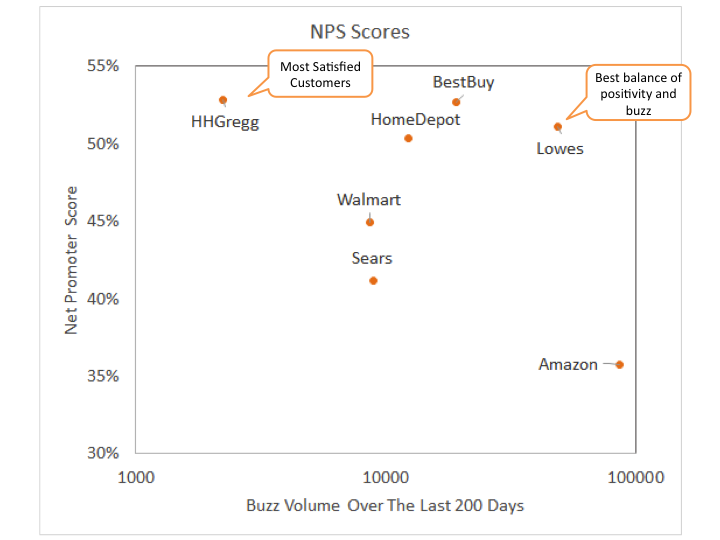 However, Lowe’s has the second greatest volume of buzz balanced with the third highest NPS, making them the real winner in the realm of practical business. 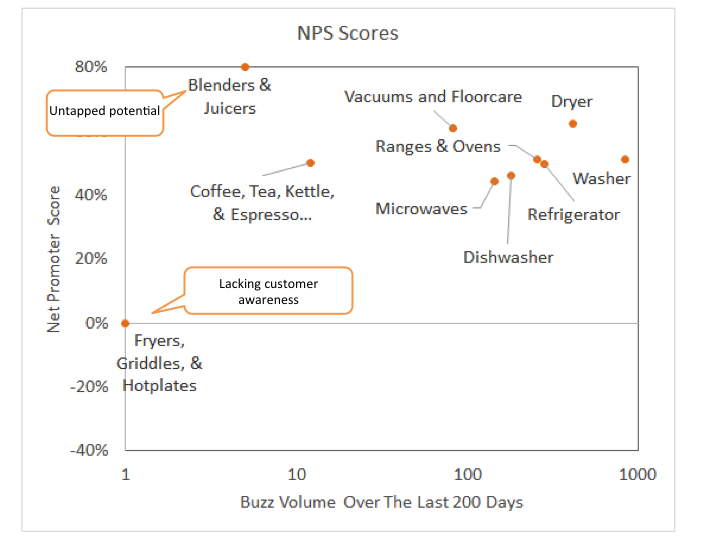 To further investigate what consumers like about HHGregg, we plotted their NPS scores by market segment. This chart demonstrates which of their products are receiving the most and/or best feedback from customers. HHGregg Dryers show the best overall, since they have high NPS, and are receiving a fair amount of buzz. Blenders and Juicers appear to be an un-mined gem, since the few consumers reviewing them have extremely positive comments. Overall, HHGregg’s NPS is higher than any other brand, and its market segments are clustered around high Net Promoter Scores too. Consumers are saying great things about their services, but not enough people are participating in the conversation. To spark growth, HHGregg needs to facilitate more discussion around their brand to boost the buzz volume for their products. If they can do that, their happy customers will multiply, putting them ahead not only in customer satisfaction, but business and brand awareness as well. Mocking the Competition: The Way to Consumer’s Hearts	Have Wearables Worn Out their Welcome?